Lake Whitney - Updated Cabin with Water Access and Hiking! This cozy lake cabin is nestled in the hills within one of Lake Whitney's most beautiful scenic areas near Rocky Creek on the Bosque County side. This is the perfect weekend place to spend time getting caught up with family, friends, or that special 'someone'. Lake Whitney has been officially recognized as the 'Getaway Capital of Texas'. Lake Whitney is often compared to a Texas Hill Country lake, but, without all the lake traffic and overbuilt lake shores. Lake Whitney's 23,500 surface acres of clear blue water and 225 miles of shoreline are sure to satisfy a broad variety of interests for those with recreational interest or just 'getting away'. Our cabin's South West lakeshore location means easy access from the I-35 corridor and SH 22. Our location is less than a 90 minute drive from most DFW metroplex locations, under an hour from Waco, and no more than 2 hours from Austin. Better yet we are within a short drive to RedCaboose Winery in Meridian, Waco's New Mammoth Park, The Dr. Pepper Museum, mountain biking at Waco's Cameron Park which is 'nationally recognized', Clifton's historical downtown, and much more! The cabin is fully-equipped with everything you might need to include: 1 queen bed, 1 double bed, 1 single bed, and 1 kids bed. (4 total person maximum limit - 3 adult max or 2 child max). We include all linens as well coffee for your early morning wakeup! If you plan on bringing your pet along, there is a large fenced yard in the back. A house broken pet is allowed inside (1 small/medium 'non-agressive breed' / E-MAIL OWNER PET DETAILS). We have also included an inside and outside CD Player with multi-artist CD's for your listening pleasure. We also provide a good assortment of DVD's as well books to enjoy during your stay. If you like to keep active or need to have the little ones keep'n busy, here are a few recreational items that we have provided at NO ADDITIONAL COST! *You can access several miles of hiking trails just down below the cabin. Feel free to walk in either direction with lake access available in multiple points of entry. Be sure to have good shoes should you decide to climb down one of the various canyons for a little cave exploration or try jumping over the running creek! One of our family favorites is to go hiking at nighttime with our flashlights when the critters come out! *You can take out the provided 3 seat canoe down to the lake for exploration or up many of the lakeshore coves. You won't believe the waterfalls and lime-stone caves that you'll find along the edges! Be sure to bring your camera as proof. The canoe can be hand carried down to the lake by two (2) adults. ADULT PARTICIPATION IS REQUIRED AND LIFE JACKETS ARE MANDATORY. Don't worry as we have provided life jackets to include: 2 small children, 2 youth for 50-90 lbs, 2 medium adults, and 1 large/extra large adult. Don't forget to bring the ores that are located inside the game room closet. LIFE JACKETS ARE MANDATORY. *Feel free to use the provided fishing poles and go fish with the kids! Our suggestion would be to use a hook with a slip weight above the hook with a bobber about 1-2 feet up the line. We have provided the fishing gear to get started. If you want to land the 'big' fish, you can stop at any of the local general stores and purchase some live worms, frozen shad, frozen shrimp, or just use a piece of hot dog. Locations for fishing are easily found in either walking direction. When you catch that 'big' fish, feel free to use the cleaning board that is hung inside the game room. *Have fun in the outside game room that has been stocked with a foosball table, electronic dart-board, a sleeping cot with checkers(in case you need a little nap! ), badminton, and other activities. The exterior window shutters open up to allow a nice breeze inside during the hot summer months. We have installed a new light inside for use during evening hours. Have fun! *Pull up some chairs and enjoy the evening with our outside fire pit (firewood is provided on the patio). PLEASE DO NOT USE IF A BURN BAN IS IN EFFECT. Turn on the gas grill and get those steaks on or that 'big' fish catch, nice and cooked! *Take a throw in our horse-shoe pit! This is a game of skill where many hours can be spent bonding with fellow friends and family members. Remember the rules: 3 points a ringer, 2 points a leaner, and 1 point for the closest shoe. First to get 21 points is declared the winner! Most of all, our cabin has been designed for 'family' style fun that we hope your family will enjoy as much as ours does. Please relax and leave your stress behind as we expect you'll have as much fun ever at Lake Whitney! Hi. My name is Bryan and live in the DFW Metroplex. Like many folks, I consider myself a 'weekender' looking to get away from the busy and complex city life where I can take the family for a quick adventure. Our place is great for family fun and exploring the beautiful shores of Lake Whitney. Have fun! We looked for almost 2 years for the perfect weekend lake cabin. 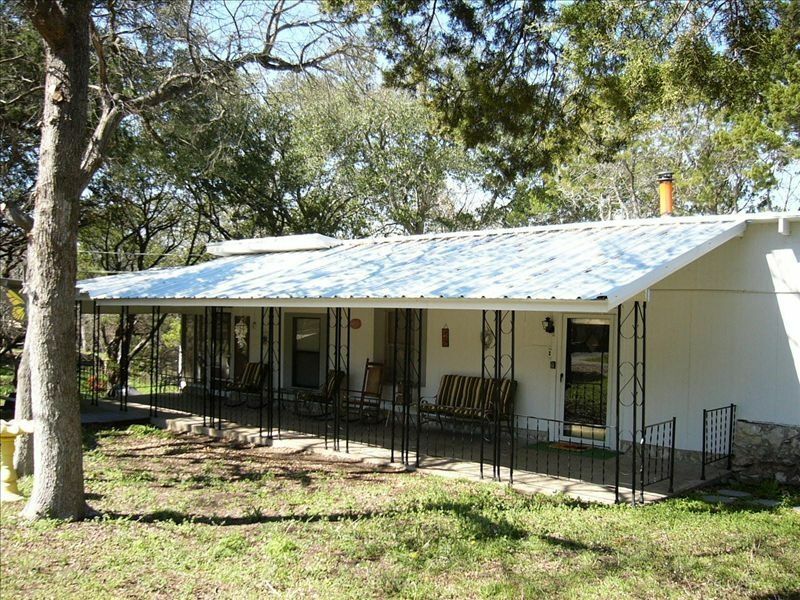 The reason we chose this cabin was the unique features of Lake Whitney with the large limestone cliffs and canyons which are spectacular as well the adjacent land owned by the Army Core of Engineer that gives us a natural setting for hiking the surrounding woods and walking the canyon floors in search of fossils. Sometimes just relaxing on the front porch and taking it easy is perfect. We enjoy cooking on the outside grill and gathering the family around for an outdoor dinner while the wives usually open a good bottle of wine while the men share their college day stories.... We enjoy the dryer climate in which you will see roadrunners, deer, cardinals, racoons, squirrels, sparrows, Texas tarantulas, native live oak, cactus, mountain cedar (juniper), and more. Our cabin provides a great central location that gives you more time to enjoy. The surrounding hills and natural limestone terrain offers unique 'hill country' habitat and wildlife such as: exotic birds, squirrels, unique animal, as a variety of native plant species. The cabin had everything we could possibly need. It was absolutely perfect and we look forward to returning. Beautiful area. Hiking was great and a fire at night was fantastic. We plan to return when it’s warm enough to be in the water. Thank you Bryan!! The place was clean, but rough around the edges. Smelled musty and over priced for what it is. Had to buy our own firewood for outdoor pit because wood that was there was too big to get the fire started. Even then, it had to be going really hot before it would burn what was there. My husband kept laughing about how one of the key words used for the listing was “luxury.” Owner answered all of my questions and offered maps and information about the area. That was appreciated. I booked this property for the weekend of 10/19-10/21 and looked very forward to the trip. Then, unfortunately, the flooding came. Bryan reached out at first and let me know there was a possibility the trails would be to muddy to enjoy and offered to exchange weekends or cancel. As the dates approached, Bryan reached back out and let me know the lake was already over normal levels and was expected to continue rising. I cancelled the reservation at that point, but felt the review was important to note the communication. Thank you Bryan and I will re-book with you soon....sending positive vibes the water stays away from your cabin. This lil house was just perfect! The only thing we brought was our clothes. our food & drinks . Everything that was needed was there! The hiking was phenomenal and the lake was to you! Had great access to the water and trails. We enjoyed it so much! Brian was great he even let us check in early and stay late! I would definitely check this little place out. Absolutely perfect! We had such a great time on our Lil mini vacay! The lake house was stocked and furnished with everything you could possibly want or need. I only brought clothes and food and that’s all I needed. Brian was so nice he even let us check in early and we could have stayed late but we didn’t. Had to drive 4 and a half hours to go home. We will for sure be back! Was a short walk to the water and we really enjoyed the hike around the lake as well. Definitely recommend this place! Brian is nothing far from an exceptional host.He provides amazing hospitality. He answered all my questions.My husband and I don’t get away much due to owning a business.We felt very at home and had everything we needed. Brian Made sure we knew where all the water spots were and local stores.We had use of canoes,tubes,life vests.This cabin has it all and then some.We were able to bring out pets which was a HUGE plus. Thank you Brian.We will be back. •	Walling Bend Lake Park: Located on the West shore at mid-lake. From Whitney Dam, go West on 22 and turn right on 56. Proceed a mile then turn right on 2841. The park is at the end of the road. Three-lane boat ramp and swimming area. $2 launch fee. Open all year. Operated by US Army Corps of Engineers . Beautiful cliff views at end of the park and roaming deer. •	Dinosaur Valley State Park: 1629 Park Road 59, Glen Rose TX 76043. See actual dinosaur footprints in the limestone creek bed along with lifesized dinosaur figures displayed in the surrounding trees. •	Waco Mammoth National Monument. A must see for the kids. Actual mammoth bone preservations under roof with the national park service. Steiner Blvd, Waco, TX. •	Cell Block Museum in Hillsboro: The museum served as the county jail until 1983 and is listed in the National Register of Historic Places. •	Magnolia Market at the Silos: Only a 30 minute drive to see Chip & Joanna Gains newest store in Downtown Waco. **I AM GLAD TO DO DIRECT MAIL PAYMENT TO SAVE ONLINE BOOKING COSTS. SEND OWNER A QUESTION WITH YOUR DATE REQUEST. ****3 Day minimum during all major Holiday Weekends including Memorial, 4th of July, Labor day, and Spring Break week. A $50 cleaning fee is required on all reservations. Minimum 25 years of age requirement for all reservations (NO exception - NO Spring Breakers), 4 guest maximum, as well current residency and citizen of USA. No out of country reservations will be made. PET POLICY: One (1) approved small non-aggressive breed dog. Please contact ownership with pet details.